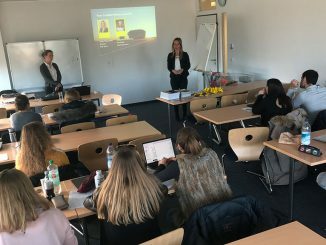 The 2nd semester Master International Business students of Munich Business School have successfully completed their Business Projects with Condé Nast Germany. Last week, they were invited by the company to present their results on new developments to gain higher attractiveness amongst their customers. Project owner was the senior Management of Condé Nast Germany supervised by the President, Moritz von Laffert, and Kelly Heitzer, Director of Human Resource Management, as well as MBS Professor Dr. Arnd Albrecht. The international student team of Jerome Antonio, Vera Khobotova, Anna Viola, and Henrique Ostmann had been working for half a year to develop ideas from scratch. 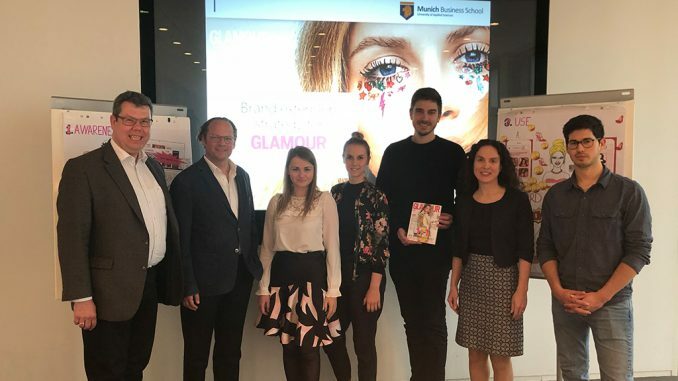 Alongside doing their studies, the Brasilian-German-Russian team mastered the challenge to develop a brand new marketing strategy for “Glamour” magazine. The above picture was taken after the successful presentation at the Condé Nast Germany headquarters (f.l.t.r. : Prof. Dr. Arnd Albrecht, Moritz von Laffert, Vera Khobotova, Anna Viola, Henrique Ostmann, Kelly Heitzer, Jerome Antonio).